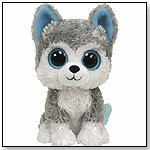 TDmonthly® - New Toys and Games: Beanie Boos - Slush from TY INC.
Other products from TY INC. This Beanie plush line from Ty features 8” characters and includes such favorites as a penguin, a panda, a koala, a monkey, a frog, and a Husky dog. — As of 05/13/2011 this product had 4.5 out of 5 stars from 8 reviews on Amazon.com. Cons: According to the user, the smile was crooked and the toy was taller and thinner than depicted, rendering it less adorable. — Beanie Boos were popular sellers at My Club Tabby in Lake Charles, La., in March 2010, Owner Natalie Comeaux told TDmonthly. — In a May 2012 survey, two out of 11 retailers said that TY Beanie Boos were their best sellers in the Plush and Puppets category. John Taylor, owner of O.P. Taylor's in Brevard, N.C., told TDmonthly that they sell 48 TY Beanie Boos each month.